Lee Mead, West End star of hit musicals Joseph, Wicked and Legally Blonde, celebrates the golden age of Hollywood in Some Enchanted Evening, a ten-date concert tour which comes to The Apex in Bury St Edmunds on Saturday 19 September. On this, his fourth UK live outing, Lee will turn back the musical clock to the 1940s and 1950s, to celebrate some of the classic songs that that have become a part of our musical heritage. Amongst the set list for the show will be ‘Some Enchanted Evening’ from the 1949 Rodgers & Hammerstein musical South Pacific; ‘Singin’ In The Rain’, the standout song made famous by Gene Kelly from the 1952 MGM musical comedy; ‘Where Or When’, performed by Judy Garland in the 1939 MGM film Babes in Arms; the Jules Steyn/Sammy Cahn song ‘I Fall In Love Too Easily’ from the movie Anchors Aweigh, and ‘I’ll See You In My Dreams’ from the eponymously titled 1951 film. Other classics will include ‘One For My Baby’ from The Sky’s The Limit, ‘Broadway Melody’ and ‘The Way You Look Tonight’ from the movie Swing Time. Lee shot to fame in 2007 when he won TV’s Any Dream Will Do and was cast in the lead role of the 2007 revival of Joseph’s Amazing Technicolour Dreamcoat. After 600 performances, Lee went to New York where he studied acting at the Lee Strasburg Institute before heading back to London’s West End for starring roles in Wicked and Legally Blonde. Lee also appeared in West End Men which played at London’s Vaudeville Theatre and toured around the UK and overseas. Lee made his debut in BBC One’s Casualty in March 2014 playing the popular character Lofty Chiltern and was shortlisted in the 2015 National Television Awards as Favourite Newcomer. Lee will be accompanied on stage by his band with new arrangements from MD Mason Neely, special guest on the tour will be Amanda Henderson who stars alongside Lee in Casualty, as Robyn Miller and who has appeared in Les Miserables and Oliver in London’s West End. Lee Mead appears at The Apex on Saturday 19 September at 7.30pm. 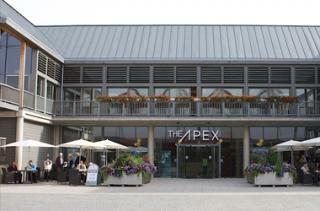 Tickets are £25, call the Box Office on 01284 758000, or visit www.theapex.co.uk for more information, or to book.